It's that time of year again. South By Southwest 2012 takes place in Austin, Texas starting on March 13th... And while odds are you won't be in attendance for Bruce Springsteen's keynote address at noon on March 15th, you don't have to head south to catch some of the great bands that will be performing. 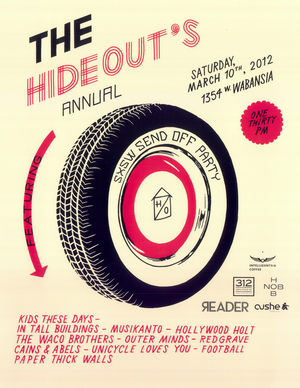 Paper Thick Walls, Redgrave, the Waco Brothers, Kids These Days and more will be performing all day this Saturday right here in Chicago starting at 1:30PM at The Hideout. One of my favorite aspects of the Chicago music community is the sense of support that I see not only from band to band but also between venue and band. This Saturday at The Hideout, for the ridiculously low price of only $10, you can catch live music all day starting at 1:30PM from eleven bands getting ready to make the Texas trek down to the South By Southwest music festival. And the best part? All of the proceeds will go to the bands heading south to represent Chicago when they perform at the fest. Paper Thick Walls - Beer for breakfast. A great reason to take it easy Friday night, get up early Saturday and head to The Hideout when doors open at 1PM. I've written quite a bit about this band of late and they will get the day's festivities started at 1:30PM. Eric Michaels and Kate Schell harmonize wonderfully as a song like "A Thousand Novels" illustrates nicely. Diverse instrumentation like upright bass, fiddle, mandolin, trumpet and guitar have evoked comparisons to artists like Arcade Fire and Sufjan Stevens but the emphasis here is on strong songwriting. I caught them in January at the Chicago Bluegrass and Blues Fest and they were solid. Redgrave - Lucked out and caught most of their set on New Year's Eve opening up for Material re-Issue at Reggie's and I'm glad I did. That night, the duo of Angie Mead and Stephen Howard performed what at times was a slow and churning, feedbackladen sludge, at other times creating a driving sonic assault driven by Mead's lead vocals. Their sound was reminiscent of anything from Black Sabbath to Local H while at other turns I was reminded of Nirvana (specifically the style of some of the slower demos on With the Lights Out). I can't wait to check them out in a full set soon. The Waco Brothers - By this point in the day, if you're still at Hideout, you'll probably have had a few beers... but it will be time to follow the band's lead and switch to whiskey. Irish whiskey. Probably that of the Jameson variety. There is no band better suited to perform at a send off party like this than The Waco Brothers. Sometimes it seems like Jon Langford lives at The Hideout, so you know the band will be fired up on Saturday. I've probably seen this band twenty times and it's just about impossible to tire of their punk infused take on country music. In Tall Buildings - It's killing me but I still haven't caught this band live (though I've heard really good things and as such need to remedy that). The brainchild of Erik Hall, In Tall Buildings builds dense soundscapes that draw on jazz influences. Kids These Days - I first caught them last September at the Hideout Block Party. They played very early, in front of a sparse crowd, on a rainy afternoon that would later feature legendary acts like Booker T. Jones and Mavis Staples... And they totally rose to the occasion delivering a set I considered to be amongst the best I saw in 2011. Since then, they've gone on to jam with everyone from Trombone Shorty to George Clinton and have been recording at the Wilco loft. They've played Lollapalooza and now they're headed to South By Southwest. I can't say enough good things about this band as I feel they're amongst the most unique in the city. A seven piece band that features a horn section, drums, keyboards, guitar, bass and three vocalists (Macie croons, Vic raps and Liam sings), Kids These Days do their best to defy description. "High Dreams" will give you a taste of just some of how much the band is capable of.